Rolling stock was supplied by Siemens-AEG of Berlin. The concourse at Xilang station on line one of the Guangzhou metro. North of Keng Kou Station line one goes underground and passes the Pearl River north of Fang Cun Station. A road tunnel, which was opened to the public in 1994, has been constructed together with the metro tunnel. Huang Sha station on line one of the Guangzhou metro. A Guangzhou metro train leaving a maintenance depot. Air conditioning units for the Guangzhou metro trains were supplied by Faively transport. From Xi Lang Station, line one runs northbound along Hua Di Road for approximately 2km. On both sides of Hua Di Road new housing and commercial facilities are under construction or have recently been completed. It is the third largest city in China, and, in December 1994, became the second, after Shanghai, to order a new light-rail system. The system is operated by the state-owned Guangzhou Metro Corporation. The city has seven million inhabitants and is situated in the south of the country near Hong Kong. Construction of a subway network was approved in 1989 and was started in 1993. The city, in the south of one of the world’s most populous countries, was initially planned to have a two-line metro system, which uses some of the latest light-rail technology, and was a model for a completely integrated project. The number of lines was, however, increased later. The metro now operates eight lines, with an additional six lines underway. "The system is operated by the state-owned Guangzhou Metro Corporation." The eight lines of the Guangzhou Metro system span a length of 223km and connect 133 stations in the city. The first phase of the 18.5km (11.5 mile) Line 1 was opened in June 1997, comprising the first 16 of the eventual 17 stations to be built on this line, along with the depot and workshops. The 17th station was opened in June 1999. The Line 2 is 31.4km long and connects 24 stations. Line 3 of the metro system is 36km long and connects 19 stations. The line 3 was extended by 29.3km to the north and south connecting 10 more stations. The fourth line is 43.8km long and connects 16 stations. The fifth line which was opened in 2009, is 31.9km long and connects 24 stations. The Guangzhou-Foshan Line is 21km long and connects 14 stations. The Zhujiang New Town Automated People Mover System is 3.9km long and connects nine stations. The eighth line is 14.8km long and connects 13 stations. Six new lines are under construction.. In addition, about 12 more lines are in the long-term plan for the metro. The total project cost is around £1bn (CNY12,700m), which includes the necessary civil works, which have been co-ordinated by the Guanghzou Metro Corporation. It has employed largely Chinese contractors, and design work was the responsibility of the design institutes of the Chinese Ministry of Railways, under the supervision of the Second Railway Survey & Design Institute in Chengdu. The first line of the Guangzhou Metro has the stations Guangzhou East and Xilang as the terminals. The line shares stations with lines 2, 3, 5 and 8. "Construction of a subway network was approved in 1989 and was started in 1993." The second line connects Sanyuanli to Jiangnanxi and has been extended to Jiahewanggang towards south and to Guangzhou South Railway Station towards north. It shares stations with lines 1, 3, 5, and 8. The third line of the metro is a Y-shaped line with Guangzhou East station, Tianhe coach terminal and Panyu Square as the terminals. The track connecting Guangzhou East station and Panyu Square is the main track of the line, while Tianhe coach terminal intersects the main line at Tiyu Xilu. Line 3 intersects lines 1, 5and 8. The fourth line connects Huangcun to Jinzhou through Wanshengwei and Huangge, and intersects with lines 5 and 8. The fifth line of the system connects Wenchong and Jiaokou and shares stations with all of the other lines. The eighth line connects Fenghuang Xincun and Wanshengwei, and intersects lines 2, 3 and 4. The Guangzhou-Foshan Line connects Kuiqi Lu and Xilang stations. It intersects line 1 at Xilang station. The Zhujiang New Town Automated People Mover System connects Linhexi and Chigang Pagoda, and intersects line 3 at Chigang Pagoda and Linhe Xi stations. For operation on Line 1, 21 trains, each comprising six vehicles, were ordered. 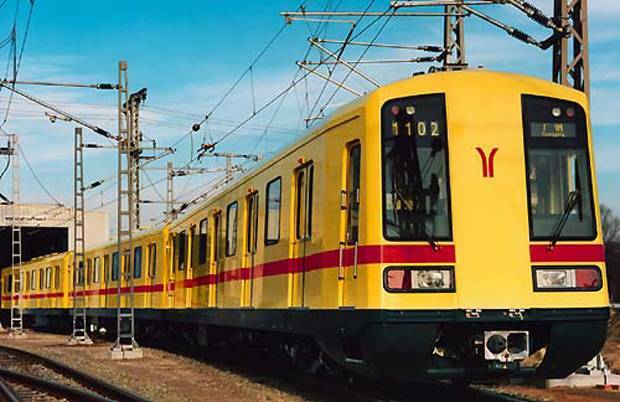 These have been supplied by Siemens-AEG of Berlin, Germany, along with the train equipment, high and medium voltage traction power supply and other ancillary control systems, including the network’s own telecommunications system. The vehicles were built in Hennigsdorf near Berlin, and the first was delivered early in 1997. As of January 2010, line 1 is operating about 126 trains supplied by Siemens and 48 by Bombardier and Chinese firm Changchun Car. On Line 2 trains have been built by a joint venture of Bombardier and Changchun Car. The first of the 26 Bombardier Movia trains were built in Germany with later trains built in China. The total fleet size operated on Line 2 is 156. The fleet of line 3 was manufactured by Siemens AG and Zhuzhou Electrical Locomotive Works. The total number of cars being operated is 120. Lines 4 and 5 have a total fleet size of 300, manufactured by Kawasaki Heavy Industries and Sifang Locomotive and Rolling Stock Series. Line 1 was inaugurated on 28 June 1999 and was built as a turnkey project by a consortium led by Siemens. It has a total length of 18.3km with 17 stations and runs from the Guanghzou Iron and Steel Works in the south-western suburb of Fangcun, crosses the Pearl River, and traverses the busy commercial district along Zhongshan Road to the East Railway Station, which is the terminus for the main line to Hong Kong. All but 2km of this line have been built underground, so that road traffic already very heavy – is affected as little as possible. Construction of line 2 started in 1999 and it was opened in April 2003, a year ahead of schedule. The line extends from south to north, starting from Pazhou in Haizhu District,via Zhongshan University and Guangzhou Arts college, across Zhujiang River to an interchange with the Metro Line 1 at GongyuanQian, to Zhongshan Memorial Hall, Fair Building, guangzhou Railway station, shanyuanli, and Baiyun Interational Airport to Jiangxia. The 17 stations on Line 1 are supported by six interlocking areas, which ensure the safety of the network and form the backbone of the signalling infrastructure, which is provided by a SIG system. The system has been installed by German-based manufacturer Siemens, and the interlockings use the latest 16-bit technology. Operators in the system’s control centre input information into workstations which then control, and adjust where necessary, the required headway between trains. An automatic train protection (ATP) system has also been installed, based on the same technology as the SIG system, to ensure complete compatibility. The acceleration and deceleration of each train is controlled by an automatic train operation (ATO) system, which determines the rate at which a train should be accelerated or decelerated, taking into account the line speed limit and the gradient of the stretch of line involved. SIG also installed the passenger information system used at the stations across the network. This also uses the latest technology, and includes displays showing the time to the next train, its destination, and calling points en route. The control centre houses systems which devise and implement the running timetable and train and staff rosters, and automatically ensure that all trains follow the correct route. The system is also the first in China to use an automated fare collection system. The system was developed and manufactured by Cubic Transportation Systems (CTS), based in San Diego, California. CTS won the contract to install the first system of its type under a contract worth $19.5m (£11.8m), which involved the installation of 400 pieces of equipment. The system includes a central computer, station computers, automatic ticket machines, fare gates, booking office machines, high-speed encoders and ticket checkers. The system uses magnetically encoded plastic tickets. In common with other, similar major projects, finance is the main obstacle to future development. Given the turmoil experienced by many of the economies of the Far East as the 20th century drew to a close, any further development was likely to involve substantial support from banks and financial institutions outside the region. Despite the enormous demand for light-rail investment, given the obvious benefits in reducing traffic congestion and pollution, the project faces immense competition from other infrastructure development plans. William Cook Rail manufactures complete rail solutions using highly engineered components for bogies, couplers, drawgear assemblies and brake discs for powered and non-powered passenger vehicles, freight vehicles and locomotives throughout the world.